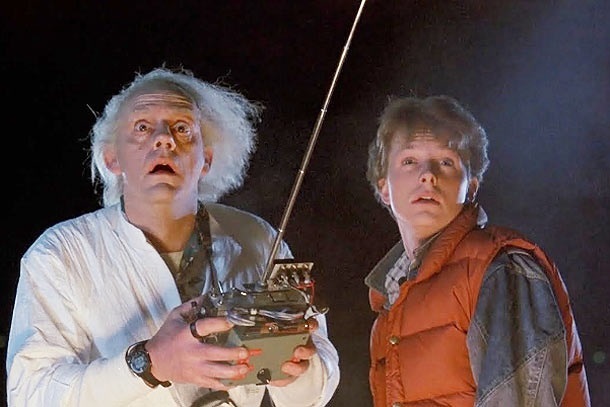 The 1985 depicted in Robert Zemeckis’ Back to the Future is as distant to us now as 1955 was to Marty McFly, the protagonist of this now-classic time-travel comedy. Looking back, the juxtaposed Eisenhower and Reagan eras of 1955 and 1985 seem to be suspiciously similar places, defined by a zeal for conformity and the acquisitiveness of their inhabitants. It shouldn’t be surprising that high school student Marty ends up in the 50’s, since at the time of Back To the Future’s release America had been trying desperately to get back there for three decades, and the election of Ronald Reagan was in many ways a referendum on transporting the entire nation there as quickly as possible. It is no small irony that Marty’s goal is to return to a future that itself was longing to escape into the past. Imbued with a cheerfully innocent worldview and plotted with clockwork precision, Back To the Future posits time travel as the ultimate self-improvement program. Marty McFly’s parents are introduced as dreary and defeated losers who quibble helplessly over trivial matters. They have no control over their lives or their fates, and Marty must watch in anguish as his father is bullied and humiliated by old high-school classmate Biff Tannen. Marty himself has a spark and strength that his parents don’t — he is determined not to share their fate — but their defeatism is a contagion to which he knows he may eventually fall prey. Marty’s greatest ambition is to be a rock and roll star (albeit of the corporatist Huey Lewis and the News variety), but he’s just been rejected from performing even at his own high school dance, and has begun to question if he’s good enough — or if the assistant principal at his school is correct in his assertion that “No McFly has ever amounted to anything in the history of Hill Valley”. Once accidentally marooned in 1955, Marty finds he has inadvertently prevented his parents from meeting and falling in love. Tasked by Doc Brown with getting them together, he coaches his own father in how to woo his mother, and discovers that George McFly has a talent buried so deep that Marty has spent his whole life unaware of it: McFly pere writes science-fiction stories, but is so terrified of failure he never shows them to anyone. Bucking up George’s confidence is necessary to achieving Marty’s immediate goal — his very survival — but it will ultimately prove key to Marty fixing the problems that he left behind in the future. Marty’s other obstacle to getting his parents together is the fact that his teenage mother Lorraine is infatuated with him in his guise as visiting student “Calvin Klein”. 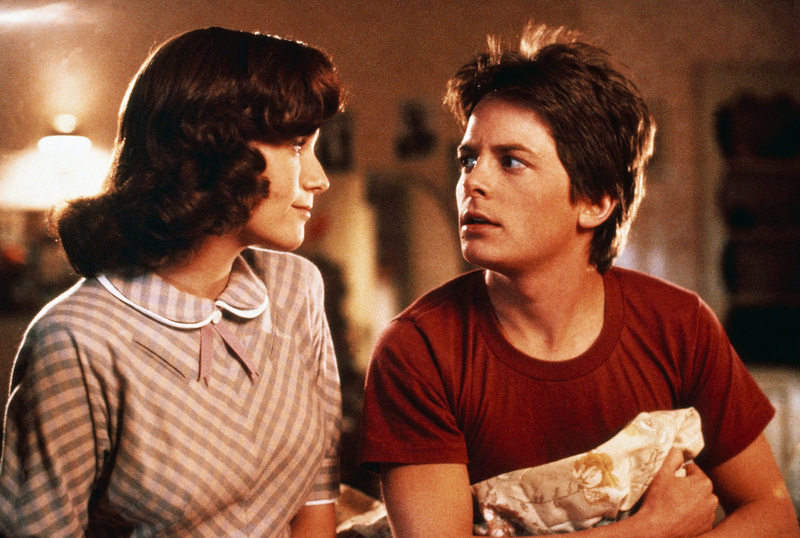 Unable to escape her attentions, Marty hatches a weirdly oedipal plan to drive her away: he takes the attractive Lorraine to the high school dance, parks the car in a secluded corner of the parking lot and makes what he presumes will be an unwanted sexual advance. 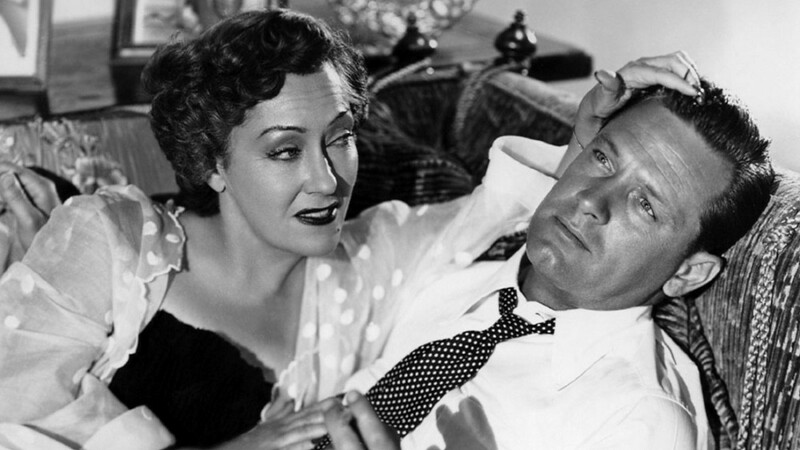 Instead, his overtures excite and encourage her, and Marty’s discovery that his mom wasn’t always a “good girl”, but she is secretly a smoker, a drinker and is presumably sexually active, is only one of the false illusions Marty has been carrying around about the supposedly staid older generation. Of course, Marty succeeds in his quest to get his parents to fall in love, but as a happy side effect he teaches George to believe in himself, and upon Marty’s return to Hill Valley of 1985 finds that his father is stylish and confident, ordering Biff Tannen around and engaging in snappy repartee with a slimmed-down and sophisticated Lorraine. Another Reagan-era indicator of worth is signaled here as well, when Marty discovers that the McFly residence is now tastefully (and expensively) appointed, though the family still inexplicably lives in the same suburban tract housing as before. Most importantly, the new pickup truck that Marty had planned to use for a weekend getaway with girlfriend Jennifer is now miraculously intact, after having been smashed-up by the counter-1985 by an irresponsible and uncontrollable Biff.As if this weren’t enough, Marty has also regained confidence in himself through an outrageous bit of cultural appropriation. Having played “Johnny B. Goode” to a star-struck teenage audience in 1955 we discover that Chuck Berry has been tipped off to Marty’s “new sound” by his cousin, the bandleader of the Starlighters, implying that Marty has accidentally created the rock n’ roll genre single-handedly. This would imply a baffling paradox but fortunately the movie doesn’t take itself that seriously, and in any event is paced too quickly for you to wonder about it. 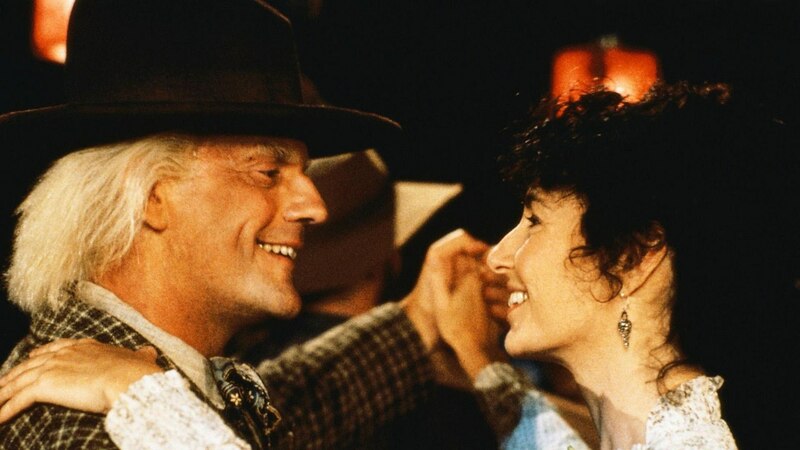 Zemeckis’ 1955 is a sanitized, Colonial Williamsburg-style version of the past, where even the casual racism of the time is played for laughs. And Doc Brown remains suitably ageless to the teenage Marty, looking exactly the same in 1955 as he would appear three decades later. Doc Brown’s role in the movie is that of Marty’s offbeat mentor and time-travel enabler, cool enough in his own eccentric way to have fashioned a time machine from a gull-winged Delorean sports car. Over the years the Delorean’s reputation has been almost entirely consumed by the film franchise and the indeed the car seems to epitomize a certain unforced 80s cool, right down to its OUTATIME vanity plate. Audiences today miss that the Delorean’s presence in the film was originally a kind of joke. John Delorean had recently been convicted of dealing cocaine in a futile attempt to keep his troubled car company afloat, and the car itself, though unquestionably stylish and innovative, had an air of zany failure about it. The success of the film led to two sequels, filmed together in order to reduce costs: Back To the Future Part II leads Marty and Doc forward in time 30 years to a haphazardly rendered 2015 in which floating skateboards and self-lacing shoes are commonplace consumer items; nostalgia for the 80s is as pronounced as 50’s nostalgia had been three decades earlier. A stolen sports almanac serves as a McGuffin that Marty and Doc pursue through time. BACK TO THE FUTURE screens Friday and Saturday, November 27 and 28, at 7:00, and Sunday, November 29 at 5:00. Tickets can be purchased here. BACK TO THE FUTURE PART II screens Friday, November 27 at 9:15, and Sunday, November 29 at 7:15. Tickets for these shows are here. 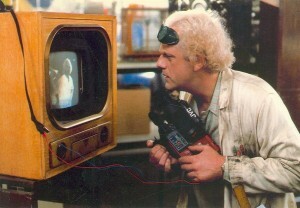 BACK TO THE FUTURE PART III screens Saturday, November 28 at 9:15 and Sunday, November 29 at 9:30. Tickets for these shows are here. Please note: We’re also offering tickets to a one-night triple feature at a discounted price: ALL THREE Back To the Future movies for $16! The show starts at 5:00 pm on Sunday, November 29. Tickets for the triple feature are here.